There are several Referees Courses being held throughout the country over the next month. Once the course is completed, it will be possible to progress through the system and even potentially progress to the FIFA International List of Referees and Assistant Referees. This gives match officials the opportunity to officiate in all parts of Europe and on occasions in other parts of the world. 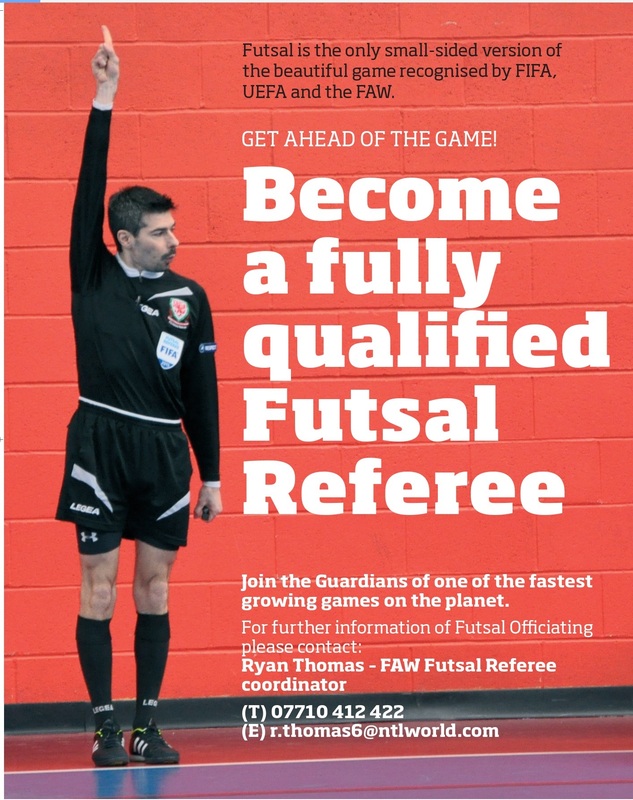 Referees Courses operate throughout the year across the whole of Wales and if you are interested in becoming a Referee, please contact FAW Referees Manager Ray Ellingham, REllingham@faw.co.uk. Over the past season the FAW and FA Futsal referees have been in an exchange program involving referees and assessors working with World Cup Final and UEFA Elite referee Marc Birkett along with first year FIFA Referee Peter Nurse and UEFA Observer Sean Dipple. This accumulated in also our FIFA Referee Valentin Cuiplea officiating in the FA’s Super league. FAW Futsal Referee Development Officer Ryan Thomas and Valentin Cuiplea were recently invited to attend the FA’s first ever Futsal Referee Conference at the National Sports Centre at Lilleshall. Topics included the difference between futsal and football on certain Laws, which was presented by special guest UEFA Futsal Referee co-ordinator Pedro Galan Nieto. Ryan Thomas said of the conference: “This has been a very educational experience, which we will take back to our own referees in the up and coming season. “It has also helped to build more relationships with the FA and UEFA and my thanks must go to Sean Dipple, Rodger Vaughn, Ian Blanchard, Dave Dixon, Marc Birkett, Ian Vaines, and the FAW for giving us permission to continue this agreement. If you’re already a football referee and would like to become a Futsal Referee, conversion courses are available. If you’re generally interested in becoming a referee, please also get in touch. As Barcelona and Sevilla get set to meet each other in the UEFA Super Cup in Tbilisi, Georgia tonight (11 August 2015), it’s incredible to reflect that it has already been a year since Real Madrid and Sevilla came to Cardiff. Gareth Bale of course featured in the Real Madrid team that won the game 2-0 in his home city to lift the UEFA Super Cup. 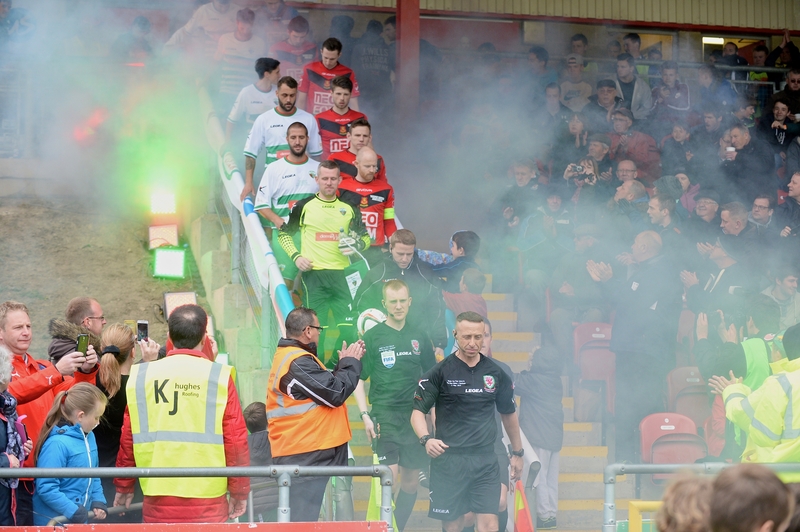 Check out the gallery from last season’s UEFA Super Cup below and read the match report that appeared on faw.cymru below. Real Madrid lifted the UEFA Super Cup in Cardiff on a cool August evening, with a display of top-class football against opponents, who gave them a match, but were not able to compare with the team of all-stars that Carlo Ancelotti has at his disposal. Cardiff City Stadium was a fitting stage for the two Spanish teams to serve-up a feast of football over the ninety minutes, to excite a passionate crowd of 30,854. The opening exchanges were almost all in favour of Real Madrid, but Sevilla goalie, Beto, was on fine form and kept Ronaldo and Bale at bay until the 30th minute, when a wonderful finish from close-range from the Portuguese star made it 1-0 to Real Madrid. From then-on for the rest of the first half, it was all from the men in white. Cardiff boy Bale was prominent in many of the moves, but understandably was well marked by the Sevilla defenders. The second half was only minutes old when Renaldo hit an unstoppable shot past the Sevilla keeper to make it 2-0. From then-on, Real Madrid took complete control of the game. Substitutions came thick and fast as both players used their squads to give as much early-season practice as possible. Sevilla fought hard, but on the night were not able to take their few chances and Real Madrid ran-out comfortable winners. The celebrations that followed were exuberant and showed how much the trophy meant to the winners. Cardiff had put on a show for the visiting UEFA dignitaries and proven that showpiece games can be held in Wales. Real Madrid: Casillas, Pepe, Ramos, Coentrao, Ronaldo, Kroos, Benzema, Rodriguez, Bale, Carvajal, Modric. Subs: Navas, Varane, Marcelo, Arbeloa, Di Maria, Isco, Illarramendi. Sevilla: Beto, Fazio, Navarro, Krychowiak, Carrico, Bacca, Suarez, Vitolo, Pareja, Parreu, Coke. Subs: Barbosa, Figueiras, Reyes, Samperio, Iborra, Aspas, Luismi. Following the success of the UEFA Super Cup, Cardiff can now look forward to hosting the UEFA Champions League Final in 2017.